With products available in more than 180 countries, Procter & Gamble is one of the largest global advertisers. Considering today's global marketplace, it has become increasingly necessary for multinational companies like Procter & Gamble to effectively communicate with people from diverse nations. This study examined the extent of standardization practiced by the company for its Pantene Pro-V line of products and which components are most commonly standardized or adapted. Analysis showed that Procter & Gamble practiced a moderate level of standardization, which allowed it to maintain a consistent brand image, while still remaining mindful of cultural differences. In today's global marketplace, it has become increasingly necessary to communicate with people from diverse nations. The growth and further expansion of multinational companies to other countries and the fact that the economies of many nations have become entwined, all necessitate improved communication. As a result of this need, the latest technology has evolved to provide new opportunities for improved communication, which has benefited the advertising industry on a global scale. These improved means of communication, such as the Internet and social media, allow advertisers to easily reach their desired target audience within each geographic market. With advertisers expected to spend $545.4 billion on advertising worldwide in 2015, up 4.9% from 2014, the question once again turns to whether or not advertisements for global products or companies should be standardized (Ad Age Datacenter, 2014). The standardization of international advertising is one topic that has been widely debated among practitioners and scholars over the last 50 years (Harris, 1994, p. 13). Proponents argue that "buyers everywhere in the world are the same, or very similar and, therefore, can be persuaded by universal advertising appeals," while opponents cite "insurmountable differences" between countries, and even regions within the same country as reason for creating separate advertisements (Harris, 1994, p. 13). Despite strong support from each side, there is a need to further examine international advertising practices conducted by multinational companies to gain a better understanding of the process before making a final decision regarding the standardization of international advertising. With operations in more than 70 countries and products available in more than 180 countries, Procter & Gamble is the largest global advertiser in terms of dollars put toward worldwide media spending (Ad Age Datacenter, 2014; "Where We Operate," n.d.). One of Procter & Gamble's first global brands was Pantene, which has quickly become one of the multinational company's top three brands with products available in more than 100 countries (Kokenge & Grubow, 2010, p. 74). By conducting a content analysis of digital advertisements produced by Pantene, one of the leading global advertisers for its global line of hair care products, the author could gauge how much this multinational company standardized advertisements across international markets and which elements in particular. Ultimately, this analysis will shed insight into how the standardization process is implemented and serve as a basis for future research into the practice of standardization by multinational companies. Despite the ongoing debate over the standardization of international advertising, previous research suggests two main approaches to international advertising: standardization and adaptation (Papavassiliou & Stathakopoulos, 1997, p. 504). In general, "standardization" has been defined as the "formulation, publication, and implementation of guidelines, rules, and specifications for common and repeated use, aimed at achieving optimum degree of order or uniformity in a given context, discipline, or field" (Business Dictionary, 2015). In the context of advertising, standardization occurs when "the execution tactics of advertising elements, such as copy and visuals, are kept the same across advertisements in various countries" (Nelson & Paek, 2007, p. 65). Therefore, international advertising standardization is defined as "using a common approach, such as a common advertising message, to promote the same product across national boundaries" (Papavassiliou & Stathakopoulos, 1997, p. 504). The second main approach to international advertising is adaptation. "Adaptation," or "adapt," is defined as "to change something so that it functions better or is better suited for a purpose" (MerriamWebster, 2015). In the context of the advertising industry, adaptation is defined as "using different advertising messages in separate markets" (Wang & Yang, 2011, p. 25). With two main approaches, it may appear as if multinational companies must select one approach over the other. However, the decision to standardize or adapt advertisements is not a dichotomous one. Rather, multinational companies choose somewhere between the two extremes of complete standardization and adaptation when they decide on the form and extent of standardization (Harris, 1994, p. 13). Researchers Papavassiliou and Stathakopoulos (1997) have also suggested that "international advertising decisions can be viewed on a continuum with two polar ends of the continuum being standardization of creative advertising strategy and tactics, and adaptation of creative advertising strategy and tactics" (p. 505). In their research, they presented a comprehensive list of factors that influence the degrees of standardization along the spectrum. The factors are divided into three levels—local, firm, and intrinsic—each of which consists of aspects, such as the local culture(s), managerial characteristics, and the relationship between the multinational company and the advertising agency respectively (Papavassiliou & Stathakopoulos, 1997, p. 506-518). By understanding standardization to be on a continuum, it is then possible to begin to examine factors that influence an advertisement's location on the continuum. 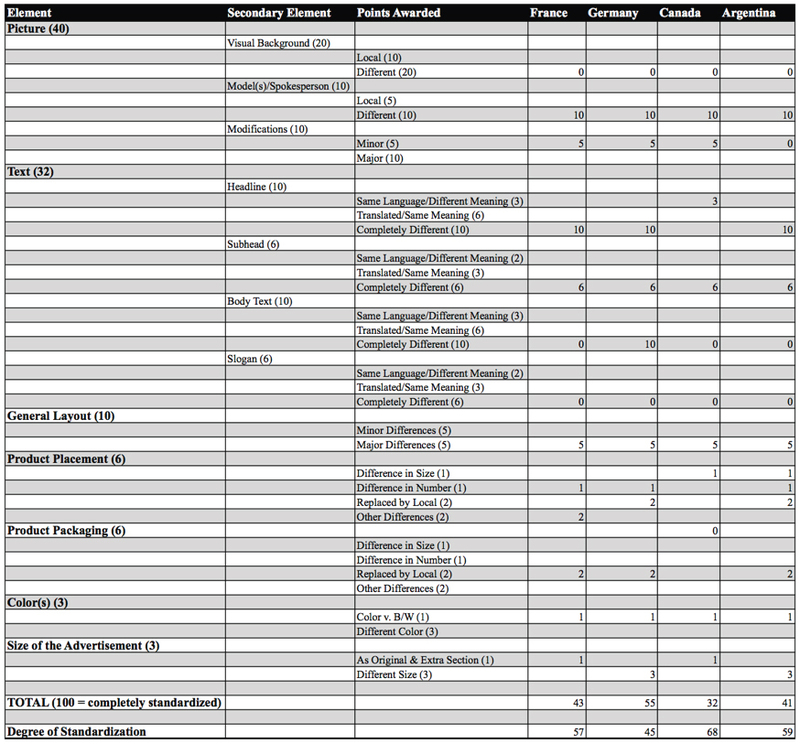 There have been several prominent content analysis studies conducted on the international advertising practices of multinational companies, including those by Mueller (1991), Whitelock and Chung (1989), and Seitz and Johar (1993). Along the same line, Harris and Attour (2003, p. 155) compared print advertisements for one brand in two different national markets. They divided an advertisement into different categories and then weighed each category based upon its importance by assigning different points. Each component was measured by an interval scale. Their study provided important insights into the practice of standardization, particularly by acknowledging that "while international advertising standardization is a widespread practice, total standardization is the exception rather than the rule" (Harris & Attour, 2003, p. 156). Based on previous studies, researchers began to pay attention to the degrees of standardization on the spectrum, while also working to understand the impact that differing degrees of standardization can have on advertising in different markets and what elements may be standardized or adapted most frequently. Harris and Attour (2003) tried to answer many of these questions by conducting their own content analysis with an updated version of a previous model. 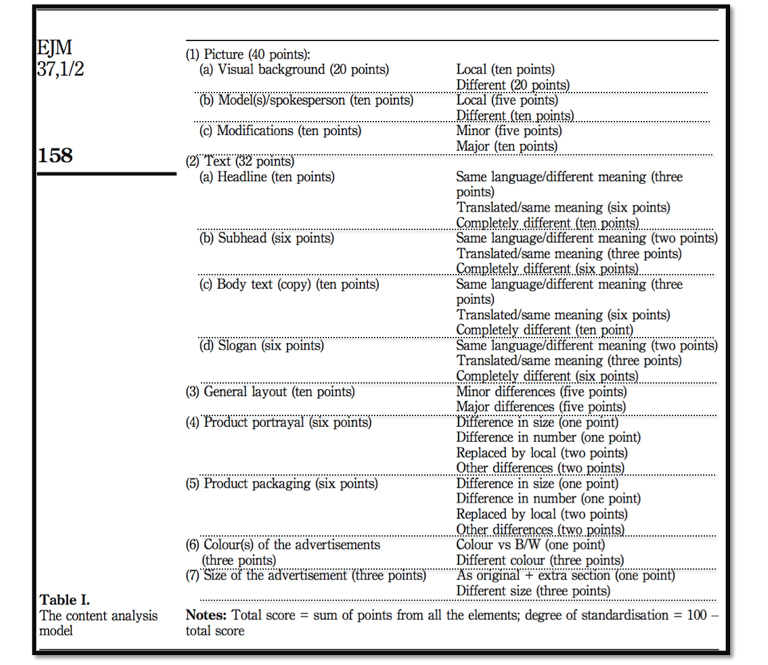 The Harris and Attour (2003) model, adapted from the Whitelock and Chung (1989) model, utilized a scoring system that allocated points to various components, such as visual elements, body copy, general layout, product placement, product packaging, color(s), and size of the advertisement (Harris & Attour, 2003, p. 156). One of the biggest differences between the two models is that the Harris and Attour (2003) model broke the elements down into more specifi c subcomponents to gather more information about which components are most commonly standardized or adapted in advertisements. For example, the visual element was broken down into three subcomponents: visual background, the models/spokespersons that appear in the advertisement, and modifi cations made to product packaging/presentation. Additionally, the copy element was broken down into four subcomponents: headline, sub-headline, body text, and slogan (Harris & Attour, 2003, p. 157). The Harris and Attour (2003) model, which is based on interviews with advertising executives (p. 157), relies on a weighted system. If a headline of an advertisement was completely different in two different nation markets—for example, it was neither in the same language nor conveyed the same meaning—then it would be awarded 10 points for dissimilarity. If it is not completely different, lower points were assigned depending on the degree of dissimilarity. After examining each of the components, the points measuring the dissimilarity would be totaled and then subtracted from a total of 100, meaning a complete similarity or standardization. The resulting number would be the degree of standardization. A more detailed version of the Harris and Attour model, complete with the scoring system, is shown in Figure 1. The left column shows the weight for each component and subcomponent; the right column shows scales used to measure the dissimilarity of an advertisement in two different nation markets. Figure 1. Harris and Attour (2003) Model Scoring System Note: This chart was used in "The International Advertising Practices of Multinational Companies: A Content Analysis Study" by G. Harris and S. Attour (2003). p, 158. RQ1: To what extent does Pantene Pro-V practice standardization? RQ2: Which elements are most commonly standardized? RQ3: Which elements are most commonly adapted? In order to content analyze the standardization of international advertising for Pantene's Pro-V products, it is important to select advertisements from various global markets. To do so, fi ve countries in which Pantene Pro-V's products were advertised were selected systematically by choosing every third country from the list of the World's 25 Largest Advertising Markets of 2015 (Ad Age Datacenter, 2014). The list, which ranks advertising markets in order of size from largest to smallest, is based on the projected major-media spending by country in 2015 (Ad Age Datacenter, 2014). Beginning with the top one and choosing every third country systematically, the author selected fi ve countries: the United States (#1, $182.7 billion), Germany (#4, $24.9 billion), France (#7, $13 billion), Canada (#10, $11.5 billion), and Argentina (#13, $8.5 billion) (Ad Age Datacenter, 2014). After selecting the advertising markets, the author selected the actual advertisements for the content analysis based on convenience sampling. Web advertisements were selected from the homepage of each country's respective Pantene Pro-V website in September 2015. Content analysis was done on the following components and subcomponents: picture (including visual background, model(s)/spokesperson, and modifi cation), text (including headline, subhead, body text, and slogan), general layout, product placement, product packaging, colors, and size of the advertisement. Finally, it is important to note that the sampled advertisements were translated into English by native speakers before analysis. Regarding RQ1 on Pantene Pro-V's standardization, the current study found that Canada scored the highest standardization score of 68, followed by Argentina (59), France (57) and Germany (45)—see Appendix A for the complete breakdown of points. The average standardization score of 57.25 is along the lines of prior studies that found total standardization and total adaptation to be the exceptions, rather than the rule (Harris & Attour, 2003; Wang & Yang, 2011). Regarding RQ2 on most commonly standardized elements, the current study found that the background and color(s) are the most commonly standardized elements. Each advertisement in the sample featured a solid white background with a gold Pantene Pro-V (vitamin) and gold liquid splash, as shown in Figure 2. Regarding RQ3 concerned the most commonly adapted elements, which often depended on the country that the advertisement was designed. The current study found these elements were the models/ spokespersons featured, the headline, product packaging, and general layout of the advertisement itself. Looking at all of the advertisements together, it is clear there was no template for what side of the advertisement the model should be on or how large the products should be featured. Each advertisement also featured a different model or models, some of whom are well-known celebrities, like Selena Gomez, the new spokeswoman for Pantene in the United States, while others featured lesser-known models. In addition to the visuals, the advertisement's copies, particularly the headlines, were noticeably different, whether in language or in meaning. For example, the headline for the advertisement from the U.S. simply reads "Strong is Beautiful," while the advertisement from Germany reads "O'Zopft Is," or "It is tapped," a common phrase used when tapping a keg at Oktoberfest in Germany. By making changes to, or adapting, elements such as these, Procter & Gamble has been able to tailor the advertisements to better suit specifi c markets. When compared to the advertisement from the United States, which was used as the control advertisement, the one from Canada was the most standardized in the sample. It shared many of the same elements in the advertisement, including visual background, language, color scheme, and product packaging. As previously discussed, the visual background and color scheme were found to be the most standardized elements, which holds true in regards to this specifi c advertisement with its white background and gold accents, including the gold Pro-V vitamin. While some of the advertisements in the sample were also originally produced in English, the Canadian advertisement was the only one, beside the advertisement from the United States, that focused on product's attribute of strength in the headline. It was also the only one that shared product packaging with the U.S. advertisement, featuring the recognizable gold band around the lid, as seen in Figure 3. 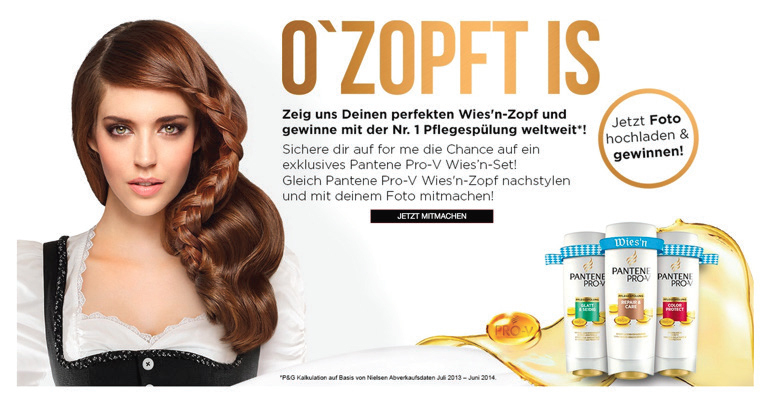 The Pantene Pro-V advertisement for Germany was the most adapted in the sample. While still featuring the solid white background and gold accents that have been standardized across the sample group, many more of the elements in this specifi c advertisement were adapted for the German audience. Beginning with the headline, "O'Zopft is,"—translated into "It is tapped," —which as mentioned earlier refers to the tapping of a keg at the Oktoberfest celebration in Germany, also known as Wies'n. In Figure 4 on the next page, the model is not only a different person, but this new model has been further adapted by being dressed in a traditional German dirndl with braided hair, which is common attire for Oktoberfest. The body copy continues on to discuss a contest where audience members can submit pictures of themselves with their best Oktoberfest braids for a chance to win an exclusive set of Pantene Pro-V Oktoberfest products, while the other advertisements focus on a certain attribute of the product, such as strength or the reparative nature of the product. At the bottom right of this advertisement, the special Oktoberfest edition of the products are featured, swathed in a white and blue checkered-pattern ribbon, which is representative of the colors of the state of Bavaria, where the celebration is held each year. Each of these elements were reviewed in order to determine the degree of standardization, and ultimately the advertisement as a whole serves as a good example of an advertisement that would fall closer to the adaptation end of the continuum. For the sampled advertisements, it was found that the multinational company Procter & Gamble practiced a moderate level of international advertising standardization. Certain elements are more often standardized than others, including background and colors. As proponents of standardization often cite as support for their position, similarities in appearance such as these allow the company to maintain a consistent image and identity throughout the world (Papavassiliou & Stathakaopoulous, 1997, p. 504). It can be said that while certain elements are adapted, the overall essence of the Pantene Pro-V advertisements remains intact. All of the sample advertisements have a sleek appearance with one or more female models who highlight attributes of one or more of the 21 products in the Pantene Pro-V collection (McMaster, 2014). The cohesive look of the advertisements with this approach enables Procter & Gamble to successfully brand the Pantene Pro-V line in the mind of consumers around the world. The ease with which advertisements can be standardized among countries may also have to do with similarities between the countries. For example, out of the fi ve sample advertisements, the advertisement from Canada received the highest score for degree of standardization against the one from the United States. While there may be a number of other factors involved, the standardization could be attributed to the similarities between the countries, such as each country's market-oriented economic system, pattern of production, and high standard of living. However, opponents of standardization are quick to point out the differences between countries, and even regions within the same country, and stress the importance of adaptation for this reason (Papavassiliou & Stathakaopoulous, 1997, p. 504). As seen from the results, the most commonly adapted elements were the model/spokesperson(s), headline, product packaging, and general layout of the advertisement. As discussed earlier, there does not appear to be a template for the layout of Pantene Pro-V advertisements, with each advertisement in the sample group featuring models, copy, and products visuals of different shapes, sizes, and colors in different locations within the advertisement. The headlines also differ in language and meaning. The advertisements from Argentina and France focus on the reparative nature of the Pantene products, while advertisements from the United States and Canada focus on the added strength the product offers. Despite some similarities, each advertisement has a different approach or wording to convey the information, and none are translated word-for-word. It can be assumed that these elements were adapted to best suit their target markets based on research and consumer insights, instead of making the somewhat dangerous, simplistic assumption that all consumers of Pantene Pro-V products are the same in their wants and needs. These differences between countries provide advertisers with a unique set of challenges and opportunities. In the sample, the advertisement from Germany, with its Oktoberfest theme, was the most adapted compared with the one from the United States. While it is not uncommon for advertisers to launch advertisements with the seasons and holidays, adapting the advertisement for Germany may have been more necessary to connect with the German target audience, as Germany has more differences with the United States in terms of economies, culture, and language than the other countries. Based on its success, practicing a moderate level of standardization appears to have enabled Procter & Gamble and its Pantene brand to find balance between establishing and maintaining a brand image and catering to consumers of different countries, cultures, and backgrounds. However, there are limitations to this research that prevent the findings from being generalized. Just because one multinational company practices a moderate level of international advertising standardization does not automatically mean that an advertisement at that level well caters to target consumers. There are many factors that must be taken into consideration when creating an advertisement and even then, it may not always resonate well with the target audience. The point of this research was to focus on the idea of a standardization-adaptation continuum that previous researchers suggested and to look at the degree to which five advertisements by one multinational company across various global markets were standardized. The author is thankful to Don Grady, associate professor and associate dean at Elon University, for his supervision and advice, without which the article could not be published. The author also appreciates numerous reviewers who have helped revise this article.